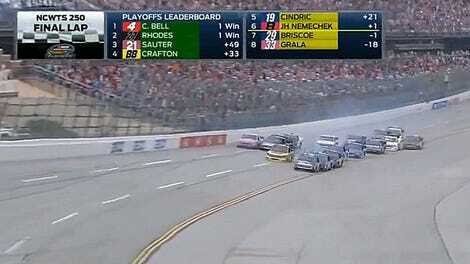 Talladega’s NASCAR Cup race didn’t start off well for playoff contender Jamie McMurray. Two-time Talladega winner Jamie McMurray’s No. 1 tried to come into the pits but traffic around him didn’t expect it, causing a collision. Erik Jones ran into the back of McMurray, spinning McMurray’s car out of control. McMurray’s car then got popped into the air when it was t-boned by No. 33 of Jeffrey Earnhardt. McMurray was gracious about the incident, accepting blame as he expected the cars around him to all be feeding into the pits. Fortunately, there’s one more round before the playoff field is cut down from 12 to 8, so there’s still a chance for McMurray. However, while McMurray currently sits in eighth place before this crash, it’s not good that he’ll be walking away with only one point for a 37th place finish when the other playoff drivers are still in the race today. Jones and Earnhardt also had to retire from the race immediately due to the damage to their cars. While McMurray took blame for the incident, Jones, his crew chief and spotter were also called to the NASCAR hauler after the race over the incident. Pits were closed immediately, but teams who opted to pit anyway are arguing that it was too hard to see the red light indicating that pit lane was closed while trying to avoid the wreck caused by McMurray’s spin-out. 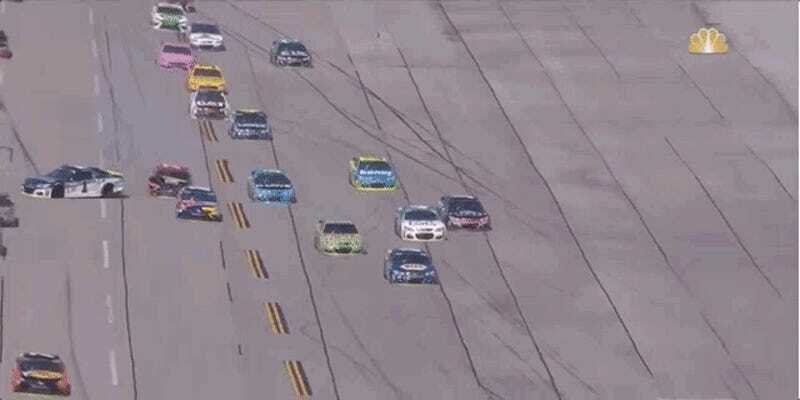 First-time Talladega polesitter who’s stayed up near the front of this race Dale Earnhardt Jr. was one of them, ceding the lead to Joey Logano. Given that he and the other penalized drivers are out on fresh tires now, they probably won’t fall too far behind for long.